Well, we finally had some rain to ease watering responsibilities but now we have another four day heat wave moving in. Hard on lettuce and peas but many of our garden plants love the warm weather. The weeds love the hot weather as well. This time of year, vegetable gardens need to be tended a few hours every week to keep the weed population in control. Since we are a community garden, it’s important to remember that your gardening habits impact your neighbors. Weed Warnings will be going out where needed!!! 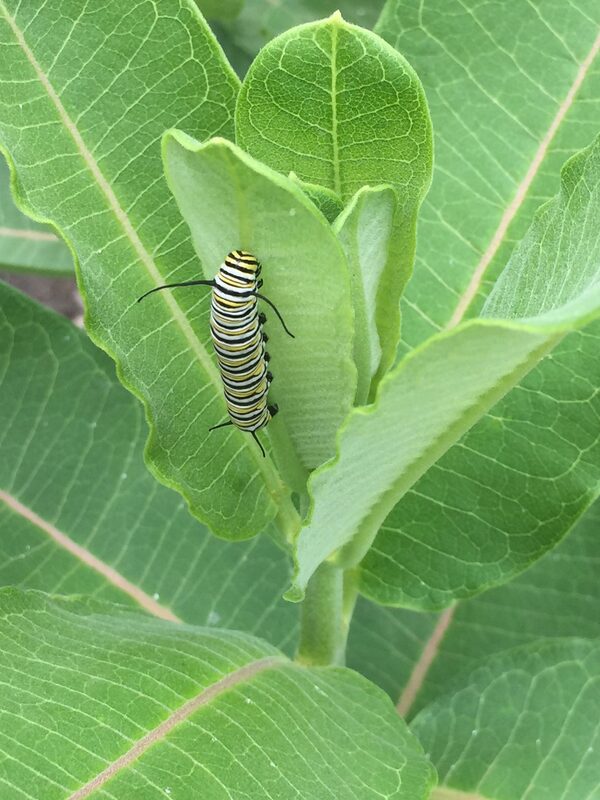 We are starting to see more caterpillars and butterflies in the garden, Those milkweed plants really do create a haven for them. Thanks to all of you who helped weed the Milkweed Reserve and to those of you who found milkweed in your plots and are incorporating them into your garden. Next weekend is Sturgis Falls celebration. The City has been erecting fencing and placing pylons around the gardens to protect them from festival attendees parking in the area.. If you move a pylon to pull in to work in your garden plot, please replace it when you leave. Let us know if you have any questions or concerns, Meanwhile, stay cool!